What can you learn from reading this book? This book is intended for those who want to use Process Builder to automate their business requirements by click, not code. Whether you are new to Salesforce or you are a seasoned expert, you want to master in Lightning Process Builder. Since Salesforce maintains an incredibly user-friendly interface, no previous experience in computer coding or programming is required. The things that you do require are your brain, your computer with a modern web browser, a free Salesforce developer org, and just basic knowledge of Salesforce. 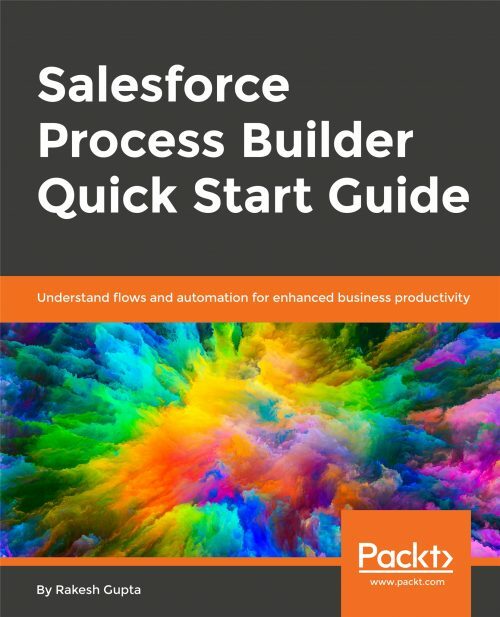 Salesforce Process Builder Quick Start is a practical guide to turbo-charge your ability to learn process builder; once mastered, you will be able to develop custom applications in Salesforce with minimal code usage. The book also explains the workings of the Process Builder so that you can create reusable processes. It also covers how you can migrate the existing Workflow Rules to one Process Builder. This Book will teach you how to mastering the Salesforce admin part, taking your skills as an administrator or developer and tuning them for the unique features of the Salesforce platform. Starts with basic knowledge of Salesforce Process Builder. We will then pick a few business examples and see how to use Process Builder instead of Apex code to solve them. We'll then discuss the benefits of using Lightning Process Builder. You will also get an overview of the Process canvas and its features. Serves as the climax of the book, where you will learn how to debug your process. We will also cover how to distribute your Process and setup recipients to receive process error emails. Helps you understand Process Builder and its concepts, such as how to use Custom Metadata Types, Custom Permissions, and Custom Labels with Process Builder. We will also cover some key concepts, such as using multiple groups of actions and how to bypass Process Builder for a user or profile. Rakesh Gupta (4x Salesforce MVP, Trainer & International Speaker) is best known as an automation champion in the Salesforce ecosystem. He has written over 150 articles on Visual Workflow and Process Builder to show how someone can use Visual Workflow and Process Builder to minimize code usage. He is one of the Visual Workflow and Process Builder experts in the industry. He has trained more than 700 individual professionals around the globe and conducted corporate training. Currently, Rakesh is working as a Salesforce solution architect. Get your copy today and becoming master in Lightning Process Builder! Automation Champion ©. All rights reserved.